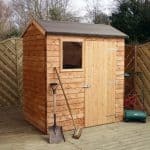 The amount of different sizes available in the Treetops Traditional Pent Tool Store Shed range is outstanding. 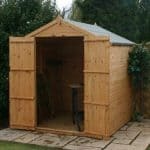 The 9’x4’ is one of the largest models on offer, making it suitable for those with a medium to high level of storage requirements. What’s interesting about this range is it offers customisable doors. There aren’t any windows included as the tool shed is specifically built to keep expensive equipment inside. Security and privacy are the leading factors focused on and this is highlighted via the use of an integrated key operated lock. It’s hard not to be impressed by the quality of this shed. The interior is also constructed from a superior quality cladding, whilst the door benefits from a thicker than average bracing. 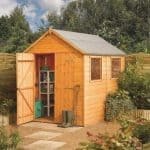 It doesn’t matter how frequently you use this shed, it will not get damaged from daily wear and tear. The walls have been dip treated which means the timber will be fully protected during shipping. You also won’t need to apply an additional treatment for around 6 weeks after installation. The only thing you need to keep in mind with this tool shed is that it doesn’t have a very tall design. The door in particular is really short compared to other sheds. So it isn’t really suitable for walking around inside. The roofing felt is the only potential downside to this shed as it has a very thin, basic design. We suggest upgrading to rectify this. This building is designed especially with tool storage in mind. 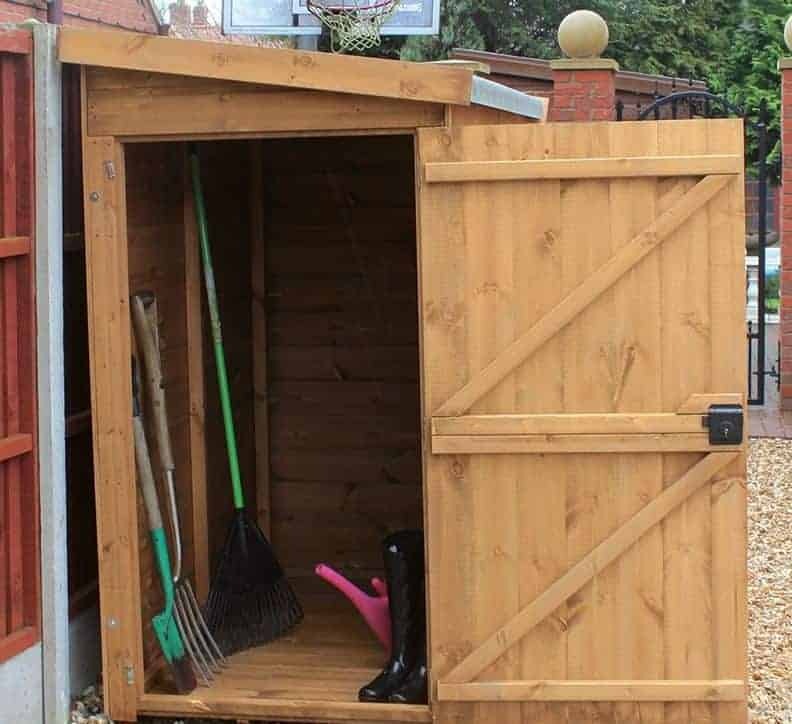 However, as it is one of the larger size models in the range, it could also be used for storing a range of equipment and gardening essentials. 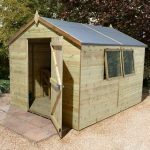 It isn’t tall enough to be used as a workshop or office space, but it does benefit from particularly wide doors and boasts an incredible depth. Compared to the other sizes in the collection, this one also has a bigger width so it is more suitable for larger equipment. The exact same 12mm tongue and groove cladding as the exterior is used for the roof and floor. It is one of the main things we really like about the Treetops Traditional range. You can tell a lot about the quality of a building by the materials it uses throughout the interior. 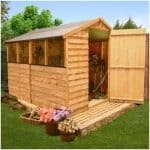 You can even see from the picture that inside the shed has the same top quality solid design as the exterior. It is given a pent style roof so that it can be erected beside another building as well as underneath low hanging bushes and trees. As the floor is really solid, it can hold all kinds of items including heavy machinery. So there are no limits to what you can store inside the shed, apart from the obvious height restrictions. To guarantee exceptional quality, DEAL Redwood timber has been used throughout. It benefits from a strong Shiplap tongue and groove style build giving it a draft-proof and waterproof design. One of the first things you will notice is just how solid this shed looks. The cladding measures 12mm thick and offers a far superior quality to overlap. Perhaps one of the best advantages it does have over overlap sheds is its unique attractive look. It also will not discolour, swell or shrink as easily as overlap. 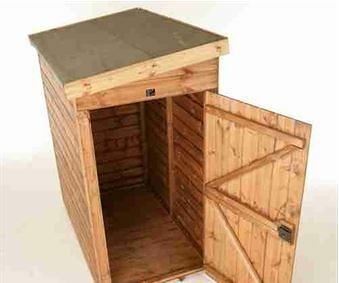 So if you want a shed that will last no matter what the weather throws its way, this is definitely the right one for you. Another reason the interior has the same solid look as the exterior is because of the thicker than average 44mm x 27mm frame. Before the shed is shipped, the timber is dip treated to make sure that no harm will come to it whilst it is being delivered. It coats the timber in a weatherproof barrier and this will need to then be topped up within 6 weeks of installation. Annual treatments are also necessary. For security, this tool shed doesn’t come with windows, but it does come with great customisable door options. Now with this range, usually you are given the option to upgrade to double doors. However, if you want this you will need to contact the manufacturer directly to see if they are available. The options you are given at checkout include keeping the single door where it is as shown in the photo, or moving it to the opposite gable. What we really like about the door is its sturdiness. It has a superbly thick design and comes fully braced. This guarantees its longevity and ensures it will not break down through daily wear and tear. Both security and privacy of this tool shed is remarkable. The most impressive feature is the built in key operated lock. It adds much more security than the pad bolts and button catches you typically find on most sheds these days. So it is ideal for storing really valuable items. No windows means no risk of anybody seeing what’s inside and this therefore reduces temptation for potential thieves to break in. The door customisation is the most unique feature of this building. You’ll find you have two options here. You can keep the door where it is, or move it to the opposite gable. These are both free so your decision is merely based upon both personal preference and where you plan to assemble the shed. Now in the description it states you can opt for double doors, but the option isn’t provided on the actual customisation options section. So if this is something you want you will need to contact Shed Store directly. Out of the two extras, the floor bearers are the most essential purchase. They help to boost the shed’s rot resistance level and keep the floor off the damp ground. They are pretty inexpensive and easy to install. Finally you have a garden building installation service. This may be slightly deeper than the other models on offer, but it is still simple to self-assemble. So you don’t need to spend money on this service if you don’t want to. There isn’t a better quality tool shed out there that can beat this Traditional Treetops range. Every single element of its design has been built to an incredible standard. The amount of wear and tear this building can withstand is exceptional. 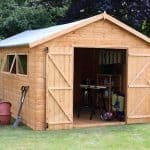 It is a very durable shed that is guaranteed to last many years. There are many different size models available in this collection and the 9’ x 4’ is one of the biggest. It offers a great amount of depth and a generous width, making it easy to store a variety of equipment and tools. A lot of customers choose the installation service, though self-assembly is pretty easy. Instructions are provided, along with all fixtures required. It’s estimated to take around 2-4 hours to install, so not bad for this size building. You really are getting an exceptional tool shed here. It offers excellent value for money and comes packed with all kinds of impressive features. 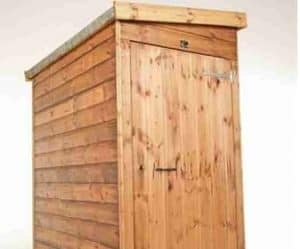 Final Thoughts: The Treetops Traditional Pent Tool Store Shed is one of the leading tool sheds on the market. You’ll see that it has some of the most positive customer reviews of any other model. The 9’x4’ model is great for those who have a high level of tools and equipment to store. 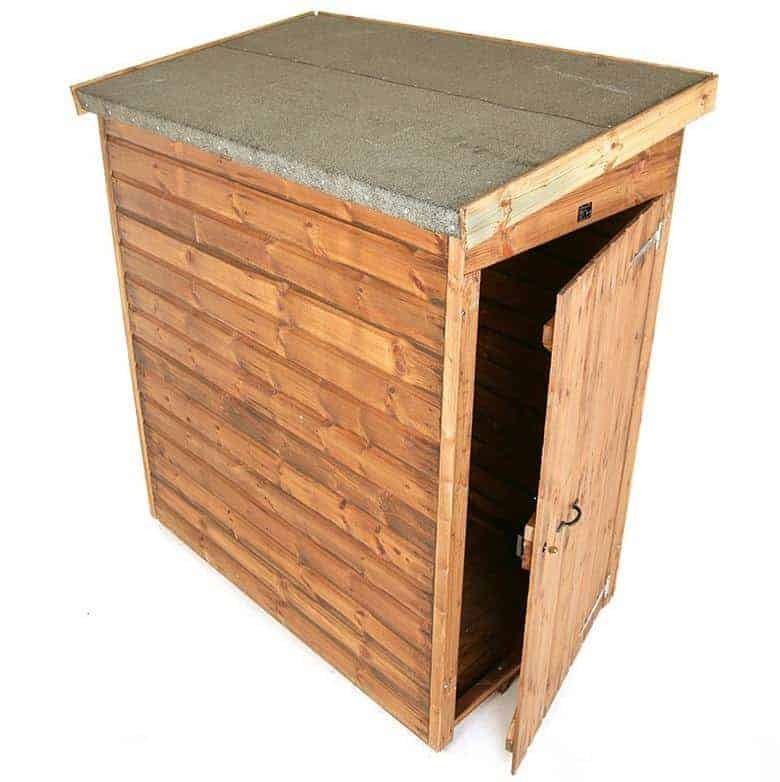 This isn’t a walk in building and it is only suitable for storing tools and general equipment. One of its key focuses is on security and the key operated lock is an excellent addition. We really love the customisation options and have only good things to say about this spectacular building.